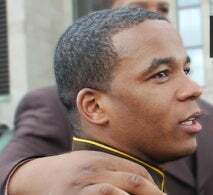 Fresh from our "Hypocrite" file, anti-violence advocate and motivational speaker Warren Jackson was charged with domestic battery for punching a woman in the face inside a parked car. Jackson, who lectures about inner-city violence, works for the charitable organization We Stop the Violence, which has recently come under fire for fraudulent activity. The Huffington Post reports that Jackson had apparently been shopping with the woman at Burlington Coat Factory, and store surveillance cameras showed Jackson and the woman arguing in the store. He was arrested last Friday evening in suburban Chicago after another woman told police she saw him turn around from the driver's seat and punch a woman sitting in the backseat. A toddler was sitting in the front passenger's seat. Kudos to the passerby for turning Jackson in to police. A big old gas face to Jackson, a scoundrel who must think that anti-violence refers to the streets and not to the home. In other news: Round 1: Harry Reid Squares Off With President Obama.